In our efforts to develop a curriculum which strengthens and nourishes all the powers of the soul - mind, heart and will - we have realized that lessons designed to engage all three powers are the most effective. These are the lessons from which the children learn the most and which they enjoy the most. This has been especially true in teaching mathematics, a subject which is too often taught in rather abstract terms. In designing our math curriculum we have taken seriously the fact that children think in very a literal and concrete way. Their ability to think abstractly is not very developed because of their age and limited life experience. They are, however, very eager to do something (the will) and to open their hearts to new experiences. We also had to take a fresh look at the nature of mathematics. Mathematics is not just about adding or subtracting numbers. It is a language. Just as our verbal language is a means of communicating thoughts and feelings, mathematics is a non-verbal language which attempts to describe our experience of space, pattern, rhythm, weight, sequence, and motion just as our verbal language attempts to describe our thoughts, feelings, ideas, etc. Mathematics is a study of relationships, as well as the rules and computations necessary to accurately express those relationships. Most people now acknowledge the importance of telling and reading stories to their children as one of the best to give children a foundation for the more formal instruction of reading and writing. When children hear a story, they put themselves into it and actually gain experiences. The children absorb an understanding that those funny marks on the page mean something, that there is a pattern to them; they form pictures of the real things or people in their mind when words are spoken. In life we are faced with real situations (concrete), not with numbers unrelated to an actual situation (abstract). Life presents us with real situations to address. Therefore, math should be taught through story problems, which are simulations of actual experiences. The situation (concrete) comes before the mechanics of arithmetic (abstract). If the math story is simple enough, children take part in it just as they place themselves into any story. Once they are “in the story”, they can understand in a concrete experiential way. Children also need objects which they can manipulate as they are being taught the basic arithmetical processes. Arithmetic textbook often have pictures to help children understand, but pictures are only a little less abstract than raw numbers. Objects that children can hold in their hands and move around as they solve a math problem engage their will and thus help deepen their understanding. If children are simply taught the mechanics of the four basic processes without multiple opportunities to experience these processes with concrete objects, their “knowledge” often becomes very superficial. These children often have difficulty with mathematics which assume a solid understanding of the fundamentals. With concrete experiences, children can understand the reasons, not just memorize the rules of mathematics. There is nothing wrong with a page of math problems to provide practice in the mechanics of arithmetic, but it is not these pages which give a child an understanding of arithmetic. This is because the numbers on a page of problems have no reality of themselves. They are symbols (abstractions) of real things (concrete). Mechanical knowledge alone can create a stumbling block to real understanding. A child may think that he knows what he is doing, but not know why he is doing it. A child may know the mechanics of borrowing in subtraction, but not know why he is “reducing the number in the tens place by one and adding ten to the units place.” We have known children who can readily perform the mechanics of addition or subtraction if given a problem on the blackboard, but are lost if asked to solve a story problem. Children who know only the mechanics often have trouble in math later on when real understanding is demanded. With these inspirations in mind, we decided to draw upon the natural love which children have for animals. Children have a special affinity for animals and we wanted a presentation that would interest them and open their hearts. In order to present the four basic operations of mathematics (addition, subtraction, multiplication and division) we have developed four animal characters, each representing one of these processes. Paddy the Beaver, who is slow, methodical and very accurate, represents addition; Mr. Minus Mouse, who represents subtraction, is generous and loves to give things away. He is one of the children’s favorite because he is also absent-minded and tends to lose things. Peter T. Times, a rabbit, thinks Paddy is much too slow and would rather multiply than add. Daniel Division, the wise owl, teaches the young animals how to share and thus represents division. Chatty, the Squirrel, who has various size storehouses helps us learn about place value. We have puppets of these characters and a story about them through which the children learn of their varied personalities. The children have told us that Daniel is the wisest because, as a bird, his kind was created on the Fifth Day of Creation, a day earlier than the others. As the children are introduced to each of the characters, they produce large crayon drawings of each, make up many, many math stories concerning their life in the forest and work out each story with manipulatives. At first, we use natural materials such as filberts, apricot pits or short (2 in.) sticks for manipulatives. These have worked well because they are just the items you might expect the animals to have. By learning the four basic mathematical operations in this way, the children acquire a heart-felt understanding, not just superficial head knowledge. The children’s enthusiasm, joy and openness to the characters actually prepares them to receive the mathematical instruction the characters symbolize. It is significant that this correlation between our emotions and learning can also be seen physiologically in our body. The part of our brain which is concerned with our emotional responses is immediately adjacent to parts very crucial to memory. We have all had the experience of having difficulty remembering under stressful conditions. We also have all had the experience of easily remembering things we enjoyed learning. Since mathematics is a language through which we can express the patterns and rhythms in creation, we have tried to find ways to demonstrate this to the children. Sometimes it is the children who show us. 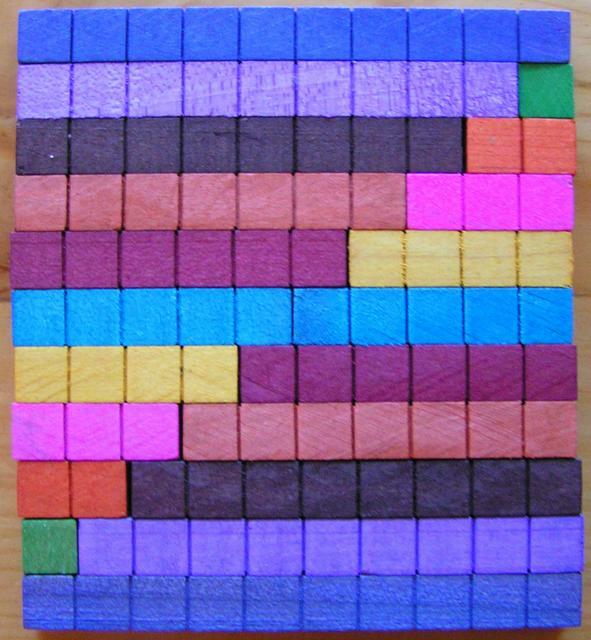 Several years ago, one of the second grade students was “experimenting” with some colorful manipulatives. With his teacher’s permission, he put a sign on his classroom door which read “Arithmetic Laboratory, Do Not Enter.” He was experimenting with various ways of arriving at a series of numbers through addition. The simple fact that a number, 7 for example, can result from adding many different combinations of numbers (0+7, 1+6, 2+5, etc.) is fascinating to a child if it is presented in a concrete, rather than abstract way. The pattern which emerged was very clear and beautiful. Now we use his discovery as a means of showing “number families” which are analogous to words families in language. Without doubt, children need to know their addition, multiplication and other basic facts by heart, but we have found abstract memorization to be much less effective and satisfying. Having objects which provide visual and spatial experience and can be moved around by the children greatly enhances their understanding of simple arithmetic facts and makes learning much more meaningful. It is the concrete approach which opens the door to these “discoveries”. One very kinesthetic way we use to give our students the feel of multiplication is by jumping the times tables on a long number line. Jumping one number at a time, then two numbers at once, then three numbers, then four and five numbers at once gives them a very concrete experience of the difference between addition and multiplication. When we tried to incorporate this technique into our math stories involving Paddy Plus (addition) and Peter T. Times (multiplication), we made some interesting discoveries. The whole story is too long to tell here, but once Peter T. Times showed Paddy Plus his a special “dance floor”. Jumping the times tables on this “dance floor”, he makes some wonderful patterns. Making this “dance floor” - a specially designed string board - and drawing these patterns has become a regular part of our teaching beginning multiplication. Instructions for making a string board are at timespatterns.html. Chatty was once a disorderly squirrel named Scatty (as in scattered) until she was given an important responsibility by Earnest Equal, King of the Numbers. Rather than leaving nuts all over the forest floor, she now keeps order by storing the nuts in various size trees. Chatty’s smallest tree can store only nine nuts, so she stores the rest in various colored bags and puts them in larger trees. Her second tree is larger and can store nine blue bags of ten nuts; her next tree, larger still, can store nine red bags each of which contains ten of the blue bags. You probably get the idea. Each time she fills a bag she says, “Look here now I have ten, I’ll bag them up and begin again.” Practice with borrowing and carrying (re-grouping) is done through many story problems, sometimes acted out in costume. At St. Michael’s the children generally memorize their multiplication tables by playing Up the Hill. This game uses dice and specially dyed wooden base ten blocks. The units are small cubes dyed green, tens are bars dyed blue, hundreds are flats dyed red and thousands are large cubes dyed green. The object of the game is to be the first player to reach a predetermined total of blocks. A child working on his two-times tables would roll the dice, add them and multiply the sum by two. He would then take from supply of manipulatives the appropriate number of blocks. The rules of the game are such that children working on various times-tables can play at the same time and have an equal opportunity to win. Initially the children use the “number family” blocks to count by twos, threes, fours, etc. Variations of the games allow for practice with adding, subtracting, re-grouping and more complicated multiplication. The same manipulatives are used to teach column, or multi-place, multiplication, e.g 45 x 38. The manipulatives are very helpful becuase the children can actually see the reason for all the steps required. We have a limited supply of these manipulative available in The School Store. Children need to know the multiplication tables not only forward, (5 x 4 =20), but also backward (how different ways are there to get to 48? ), and “inside-out” (easily recognizing common factors). We have a couple games available for free download in the Curriculum Ideas section of the website. We have found that children not only need to be able to translate a story problem into one of the arithmetic processes, but also be able to develop an appropriate story based on the number problem. One technique we have use to solidify understanding of story problems involves having the students make up a problem represented by a number problem written on the board. When it came time to introduce the middle grade students to geometry, we wanted to follow the same principle of “from the concrete to the abstract”. All the geometry books we had seen started the study of geometry with the definition of a point, a line, a ray, a triangle, etc., then proceeded to various geometric proofs. We wanted something with a more intuitive approach. Then we discovered a publisher called Key Curriculum. Although they have workbooks on several aspects of mathematics, we were interested in their approach to geometry because the entire course is done with a compass and a straight edge - just like the ancient cultures. The students learn about all the forms and principles of geometry in an experimental way rather than through memorization. The course does not provide very good tests, so made our own. These are available for anyone interested.